Medavakkam is a residential locality in the south of Chennai Metropolitan city which is adjacent to the neighbourhood of Sholinganallur, Madipakkam, Selaiyur, Keelkattalai, Velachery and Tambaram and it is center place to the developing suburbs like Ponmar, Ottiyambakkam and Sithalapakkam. Medavakkam is administered by Village Panchayat, which comes under the Shollinganallur MLA Constituency and South Chennai MP Constituency. This location is a fast developing residential locality due to its close proximity to the IT corridor OMR (approx 4 km from Sholinganallur) and SEZ in Medavakkam Sholinganallur Road. 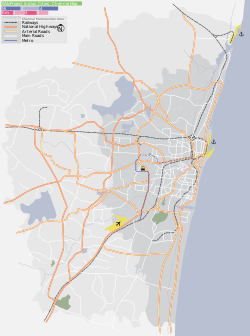 Some of the areas in Medavakkam are Vadakupattu, Annai Indira Nagar, Babu Nagar, Somu Nagar, Munusamy Nagar, Vimala Nagar, VGP Pushpa Nagar, Aishwarya Gardens, Aishwarya Garden Extn, Soumya Nagar, Jayachandran nagar, Green Court(Jalladianpet), BHEL Nagar, Sairam Nagar, Gayathri Nagar, Veerabadra Nagar,ramahia nagar, Senthamizh Nagar, Sivagami Nagar, Royal Garden, RG Nagar(Royal Garden Nagar), Iyappa Nagar. The major roads linking Medavakkam junction are Velachery Tambaram Road, Medavakkam Mambakkam Main Road and Medavakkam Sholinganallur Road. Many prime areas on GST road - Chrompet, Pallavaram, St.Thomas Mount can be easily accessed from this junction. According to a 2012 report by global property consultant Knight Frank, the neighbourhood has emerged as India's 6th largest destination for investment in the residential real estate, in the list of 13-top residential destinations in the country from an investment point of view, where housing prices are expected to increase by 103 percent over the period 2012-2017. ^ PTI (20 November 2012). "Ulwe in Mumbai emerges as top destination for realty investment". The Economic Times. New Delhi: The Times Group. Retrieved 21 November 2012. This page was last edited on 6 April 2019, at 00:37 (UTC).